Powerhouse couple Jennifer Lopez and Alex Rodriguez announced their engagement last week! The multi-million dollar engagement ring is absolutely gorgeous, and we can’t wait to share ALL the details. This engagement is neither J-Lo’s or A-Rod’s first rodeo, but the world still can’t get enough of the “J-Rod” love story. And neither can we! Do these two really need an introduction? Probably not. Jennifer Lopez has literally been around the block in her career- from singer, actress, and dancer to designer and director- with no plans of stopping anytime soon. Alexander Rodriguez held the most lucrative contract in baseball history when he signed a 10-year $275 million dollar deal with the Yankees in 2007. He played his final game in professional baseball on August 12, 2016. The two briefly met years ago, but didn’t start dating until bumping into one another in 2016. Lopez gushed on the Today show that Rodriguez was nervous throughout their first dinner. She thought it was a date, but he wasn’t so sure. We’re just glad to know that even high profile celebs have those same awkward encounters. When A-Rod figured out it was in fact a first ‘date,’ the couple was inseparable, and made it red-carpet official at the 2017 Met Gala. Sources close to the couple shared that Lopez had no idea A-Rod was planning to propose during their recent romantic Bahamas getaway. Only a few close family and friends knew Rodriguez was planning to propose, but their children have been hoping their parents would marry for a long time. J-Lo has twins from her previous marriage with Marc Anthony, and A-Rod and his ex-wife Cynthia Scurtis have two daughters. The estimated 10-15 carat diamond has the entire jewelry community in awe. It’s a gorgeous emerald cut sparkler worth somewhere in the range of $1 to $5 million dollars. Whichever celebrity jeweler A-Rod chose did GOOD. Rumor has it A-Rod designed the whole ring himself, and spent a lot of time getting it juuuusssst right for his bride-to-be. The emerald cut diamond has been the star of many a celebrity engagement ring, including those of Amal Clooney and Elizabeth Taylor. The emerald cut diamond gained popularity during the 1920’s Art Deco movement. It’s extremely common to find emerald diamonds as the center stone in vintage engagement rings. The straight, clean cut, and “hall of mirrors” effect provide a wow factor that other diamonds lack. 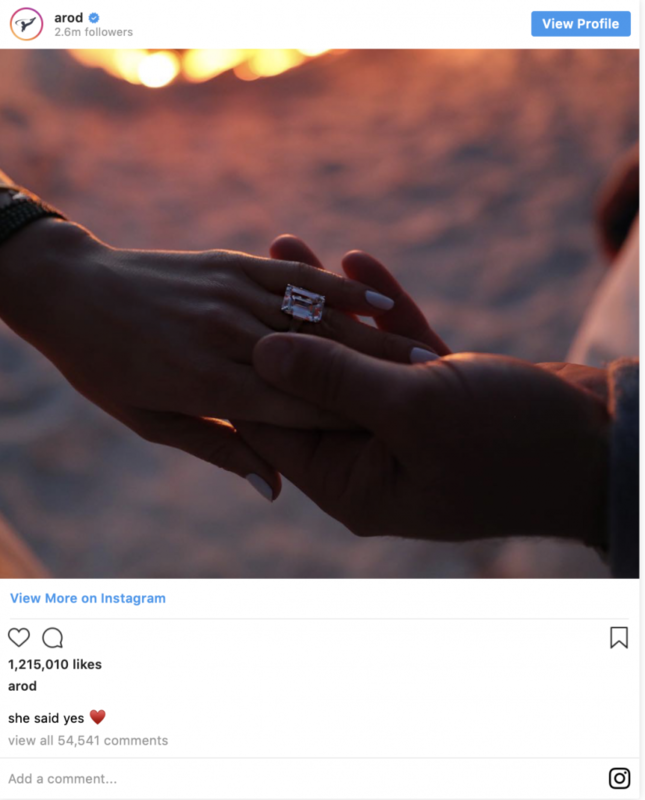 Designers are guessing emerald cut diamond rings will soon skyrocket in popularity after Lopez showcased hers on Instagram. Like we said before, both individuals have been married previously. Lopez has been married three times, and each engagement ring has had a ripple effect on the diamond industry. The rare Harry Winston pink diamond she received form Ben Affleck triggered the popularity of colored gems in engagement rings. Pink diamonds have since catapulted in value as well. If purchasing an emerald cut, stone quality should be near perfect since this particular cut easily exposes diamond inclusions. Like A-Rod would have proposed with anything less than. Are you interested in creating your engagement ring with a loose diamond from our inventory? Contact Sergio@jfjco.com to schedule an appointment and find the perfect diamond today.